Play your favorite streaming service. This Yamaha RX-V381BL AV receiver is equipped with Bluetooth functionality to let you enjoy easy wireless music playback from smartphones and other devices. The Compressed Music Enhancer from Yamaha is now optimized for Bluetooth audio transmissions to ensure that your music will have vivid, lively sound quality during wireless playback. Hear more. When music is encoded into a digitally compressed format like MP3, the frequency response suffers. The Compressed Music Enhancer in the Yamaha RX-V381BL employs sophisticated digital signal processing using exclusive algorithms to restore what was lost, so the music always sounds the way it should. Darker blacks, whiter whites and more vivid colors. This Yamaha RX-V381BL unit supports the latest HDMI standards thanks to the transmission of 4K video at 60 frames per second (pass-through only). Fully enjoy the high definition video quality of 4K without degradation along with HDCP 2.2 that fully complies with the latest copyright protection, a standard for 4K video transmission. It also supports the wider color gamut of BT.2020 pass-through. Every room is different. YPAO (Yamaha Parametric room Acoustic Optimizer) analyzes the room acoustics and adjusts various audio parameters for optimum sound in just a few minutes ensuring that the listening area is tuned to provide the best audio experience possible. Experience different venues. With CINEMA DSP, experience a sound field that allows you to transform the dynamics of the listening environment with the acoustics of famous venues from all around the world. Enjoy quality sound. This Yamaha RX-V381BL AV receiver was designed with a strong focus on achieving exceptionally high sound clarity. It employs a discrete amp configuration and a low-jitter PLL circuit, which contribute to its excellent audio performance. Ready, set, go. Pressing a SCENE button powers on the Yamaha RX-V381BL AV receiver and selects the input source and DSP mode. You can reset the buttons for different sources by selecting a source and DSP mode, then pressing a SCENE button for more than three seconds. Install with ease. 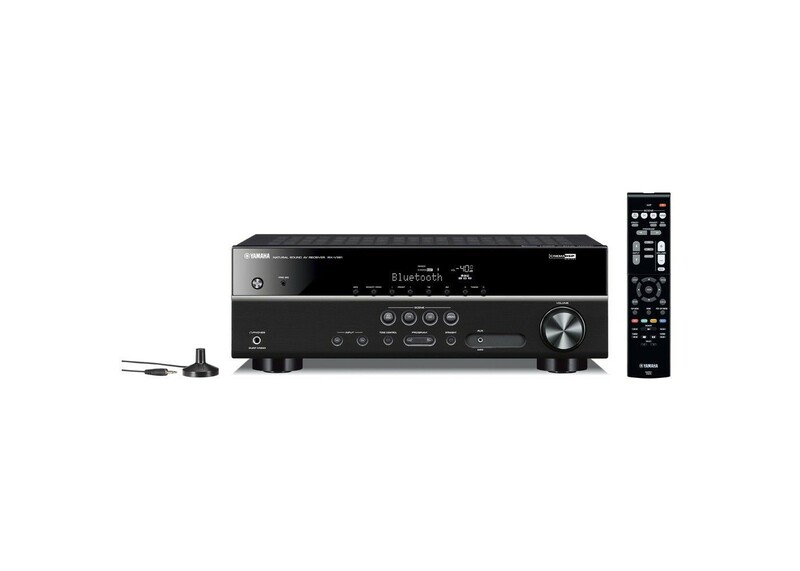 The AV SETUP GUIDE makes it much easier to perform the set up process with the Yamaha RX-V381BL AV receiver. This app assists you with cable connections between the AV receiver and source devices. Additionally, it guides you through various settings such as speaker connections, TV and source device connections and power amplifier assignments. System illustrations and actual AV receiver images help you understand how to make the connections between devices. It is available in multiple languages and is designed for iOS and Android tablets. Go green. When ECO mode is turned on it can reduce power consumption by about 20 percent. Compared to power consumption when ECO mode is off (Yamaha measurement). Be lazy. Auto Power Standby lets you save energy by automatically turning off the Yamaha RX-V381BL AV receiver's power after 20 minutes, two, four, eight or 12 hours.